Wheek, hope everypiggy and their humans had a wonderful and food-filled holiday season! Whee certainly did! Being the spoiled cavies that we are, we received lots of goodies for Christmas (including veggies and new fresh batches of timothy and bluegrass orchard hay). 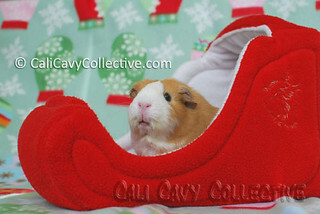 This cute piggy sized fleece sleigh from Sewing 4 A Cause was one of our gifts. It comes with a reversible pad on the bottom that can be removed and washed separately from the sleigh itself. 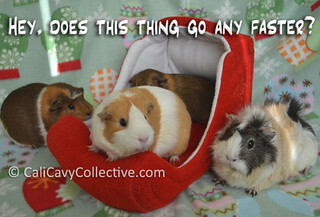 As you can see from our pigtures, the sleigh can fit three of us guinea pigs, but we never like to share so that is obviously not going to happen when we are left to our own devices. Peaches on the lookout. She doesn't want to get a speeding ticket! Wow, the sledge is amazing! Even cooler than Boomzillas Christmas pudding bed. Whee may disagree about that, a Christmas pudding bed sounds very interesting to us! Mostly because it sounds as if it would be edible - maybe a giant pile of veggies. 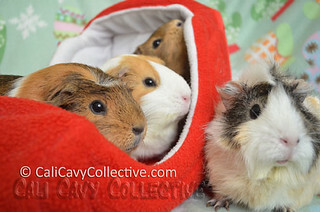 The Cali Cavy Collective is the best professional piggy modeling agency on the planet. I'd read Vogue if they'd hire the Collective. Thank you Mr. Brian! Whee would read Vogue too if they featured piggies. But alas, cavies are too couture for the likes of Vogue.